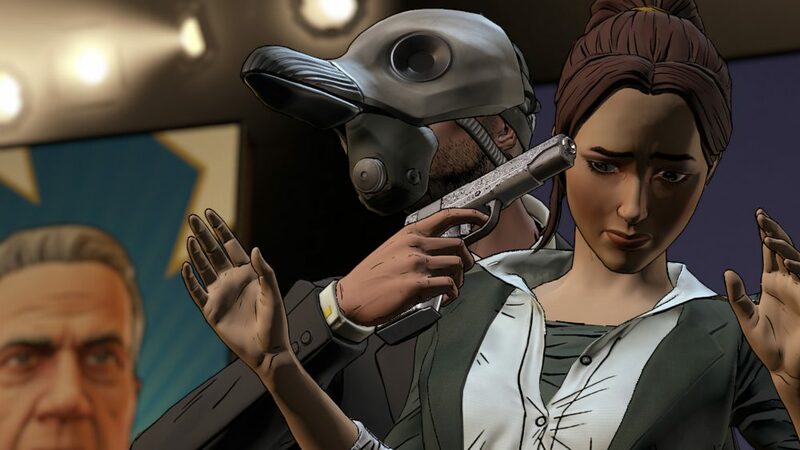 After cutting its teeth on properties like Sam & Max and Back to the Future, Telltale Games has since proven its talents with immersive and thought provoking takes on The Walking Dead, Fables, Minecraft and even the ever-popular world of Westeros. Now, after successful trips to all of those well known realms, the well-liked adventure gaming studio is back with one of its most ambitious projects to date. 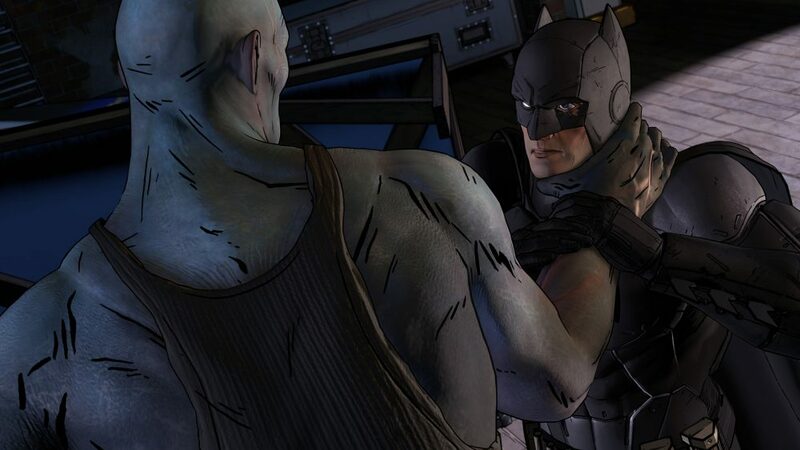 That is, Batman: The Telltale Series. Telltale set itself up in E3’s concourse hall this year and is currently residing in a two room booth of sorts. Though it looks like an unassuming, snapped together cubicle from the outside, it’s much more than that, because what’s inside stands up against some of the best booths at the Expo. As soon as you enter Telltale’s confines, it becomes obvious that you’re entering into something special. A large television displaying Gotham’s fake news and weather may be a focal point of the room, but it’s what surrounds it that truly stands out. Rich, detailed wood work gives the air of prestige and richness, while statues, books and other accents truly make the environment feel like Wayne Manor. 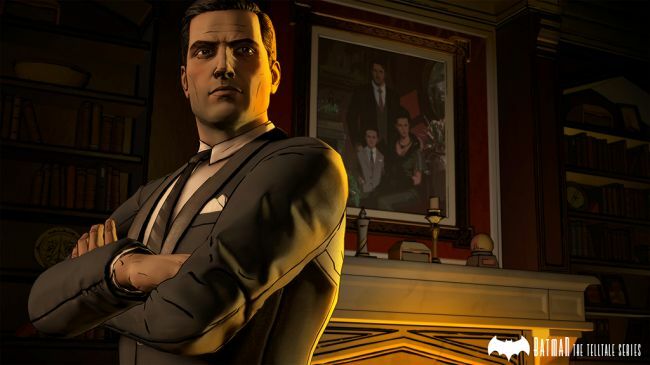 Throw in the exquisite-looking furniture, the butler-esque bartender and the crystal decanter, and you have an authentic booth for a preview of a Batman game. That’s not all, though, as it’s not the TV where the guided walkthrough takes place. No, sir. 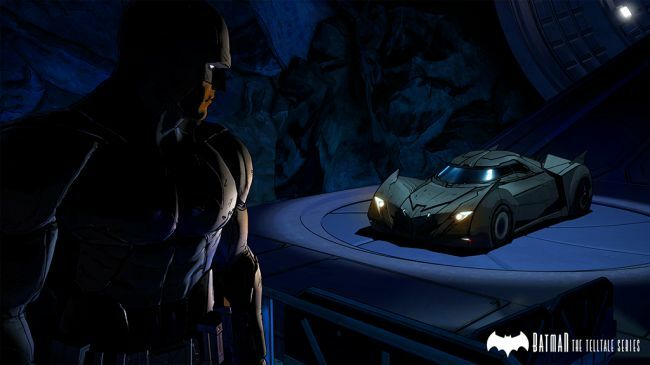 That part of the experience takes place in a second room, which has a button-controlled door and is designed to look like the Batcave. 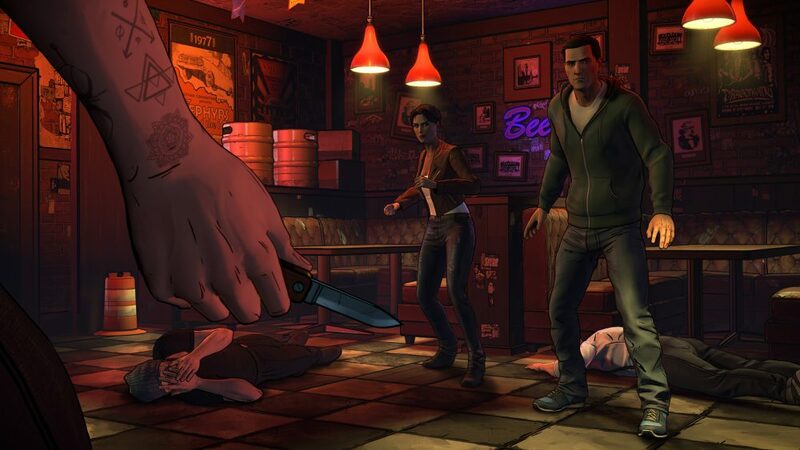 Following an alcoholic beverage of choice, we all followed Telltale’s PR reps into their lair. 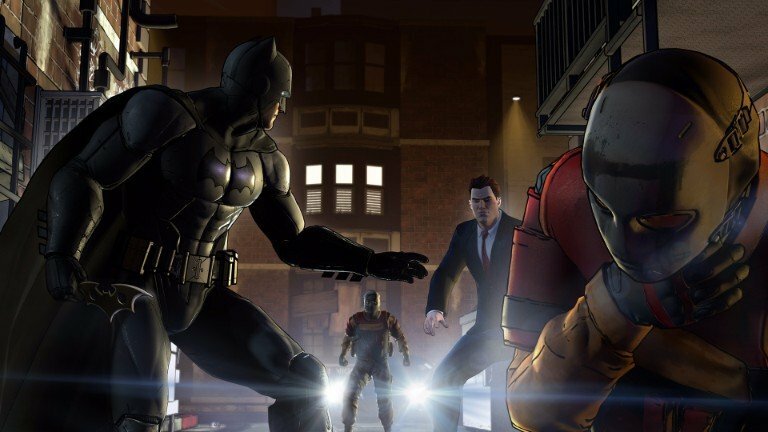 There, we watched as one of the game’s developers played through the first 30 minutes of the studio’s Batman game, using an Xbox 360 controller and what seemed to be a PC build. It was interesting, immersive and entertaining, and gave me even more reason to look forward to the release of its first of five episodes. The game begins by showing a robbery in progress. 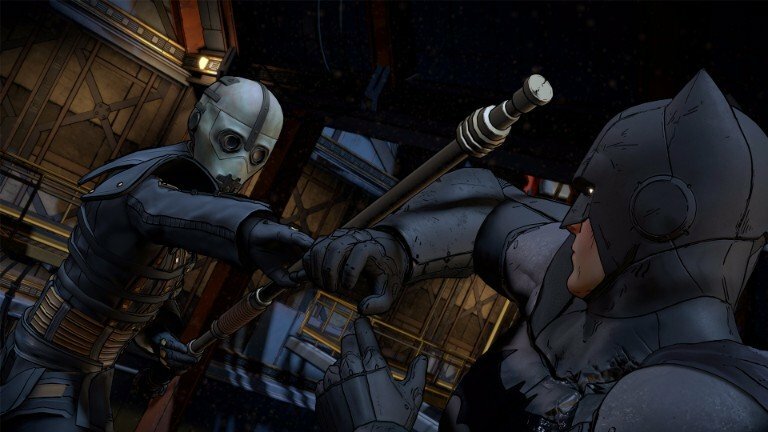 Masked bandits wearing balaclavas that bear what looks to be Bane’s insignia on them have silently entered one of Gotham’s biggest banks, and are quick to dispatch of its nighttime security guard with a shot to the head. They’re not careful enough afterwards, however, and end up tripping the alarm after walking through a security laser beam. Not long after, the police approach the location, with Batman not far off. 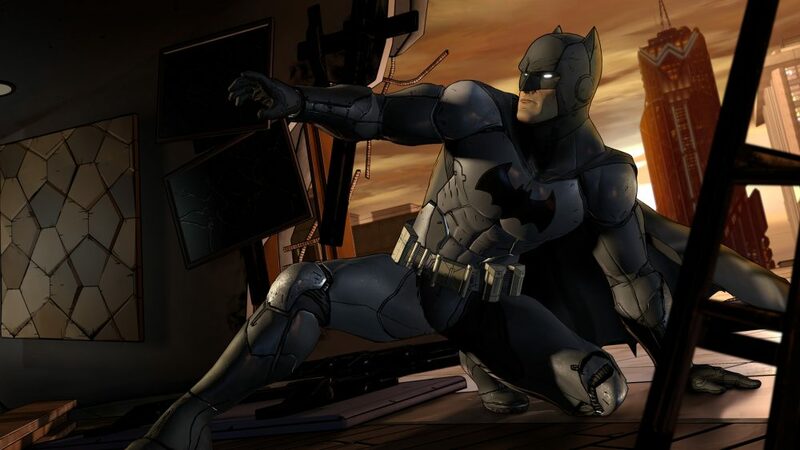 After scoping the place out from a rooftop vantage point, the Caped Crusader enters the building by smashing through some of its windows and taking out an unsuspecting baddie. Then, following that impressive entrance, Gotham’s stealthy protector uses his wits and his gadgets to take out some of the other robbers. They’re not his only threat, though, because it isn’t long before one Selina Kyle also comes into the picture, while attempting to steal some sort of valuable from the bank. This sets up a pretty badass encounter between the two, featuring timed button prompts and joystick maneuvers. 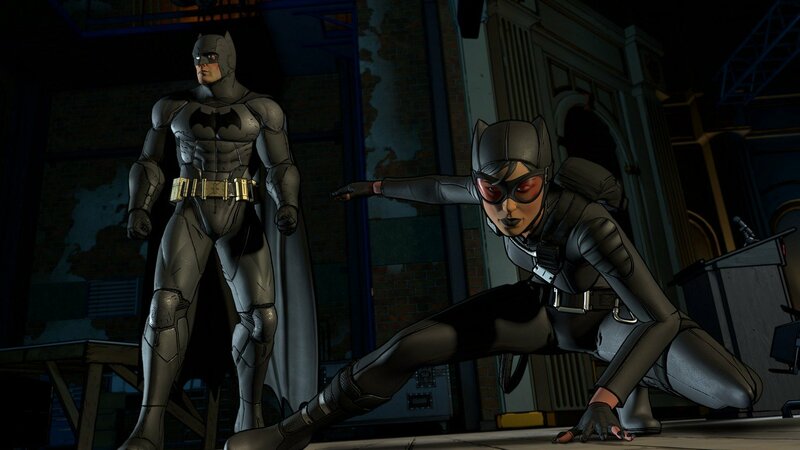 It’s visceral, fast-paced and more action-packed than anything Telltale has ever done before. While the bank scene is playing out, there are flash-forwards to Bruce Wayne at his manor, as he gets ready for a political fundraiser (for Harvey Dent) with the help of his butler, Alfred. 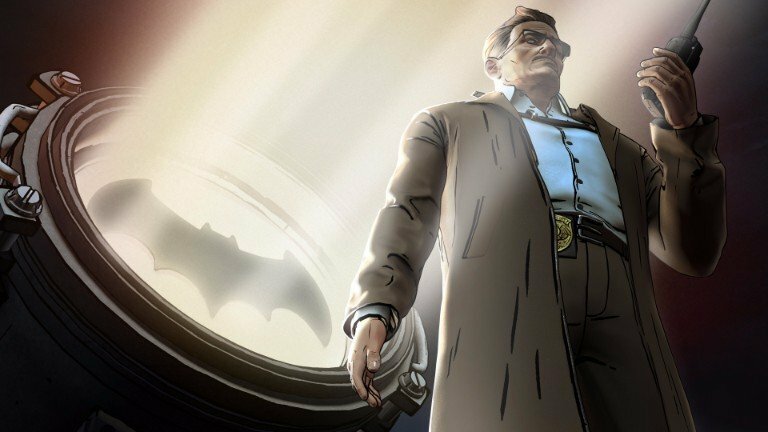 The latter half of the demo was entirely focused on this event, and showed how Telltale’s Batman series isn’t just about the Caped Crusader. 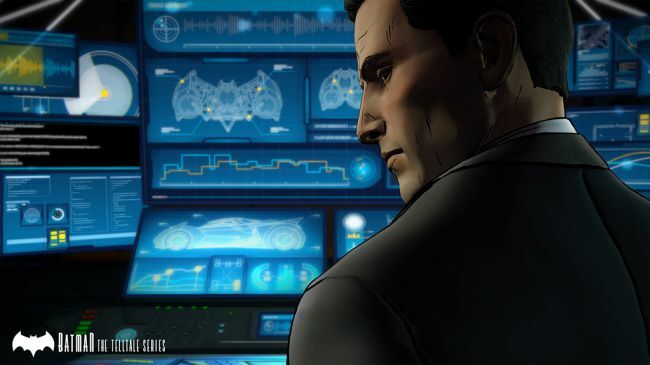 In fact, it was said that we will spend approximately 50% of the game as Bruce Wayne, who must navigate political and personal landmines while dealing with friends, allies and other civilians, like the city’s mob boss (Carmine Falcone) and its most intrepid reporter (Vicki Vale). What you say, do and decide will decide how these characters interact with you, and whether they like or hate you, but you surely guessed that. 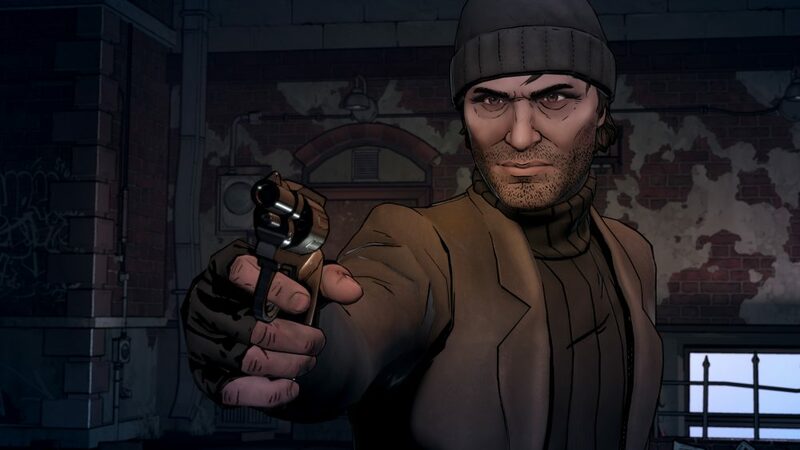 All of the above takes place within a game that runs on an improved version of Telltale’s engine, and features better lighting effects as well as beefed up visuals that are full of expression lines. The story itself is also noteworthy, because it takes place during the earlier portion of Bruce’s career as Batman, and begs the question as to whether he’s responsible for the creation of some of his enemies. 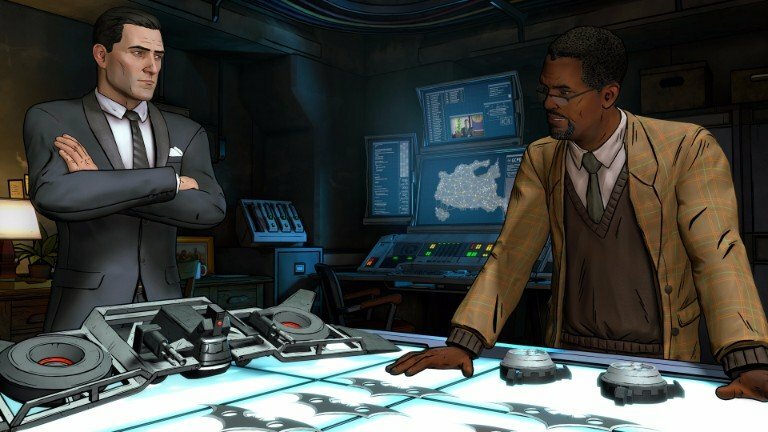 Most importantly, it all looks to be both fun and more polished than anything Telltale has ever done before, not to mention more action packed. 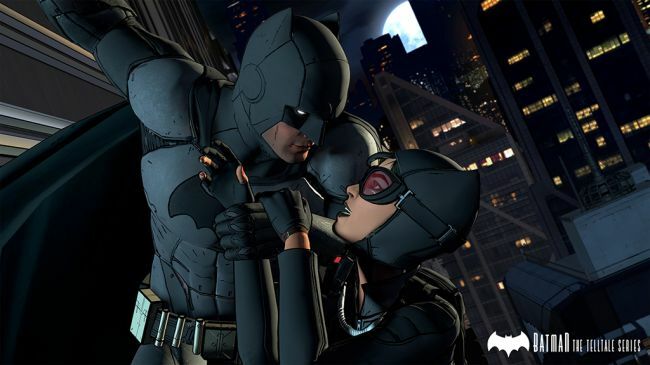 As such, it’s very possible that Batman: The Telltale Series will end up being their best game yet.